Well, I wouldn’t call it bland, but yeah – generally, IT’S SUPPOSED TO BE. Why? 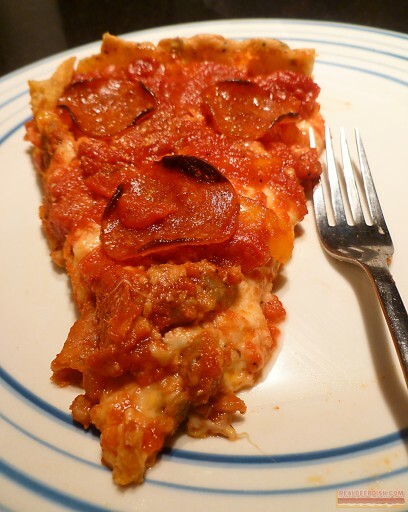 Because you are putting so many savory, flavorful (and salty) ingredients inside a deep dish pizza that, while the crust is chiefly made to contain those ingredients (the reason the sides go up the edge of the pan), it is also made to contrast all of the intensely flavored ingredients that you put inside. so it makes sense that you’d need a counter-balance to that. A noticeable difference between deep dish crust and other pizza crusts is that the crust is more of a supporting player and not the star, but without it, everything falls apart… literally. In this regard, deep dish pizza crust is not unlike pie crust. Both play second fiddle to the stuff inside, and provide a contrast in texture and taste, compared to the filling they support. 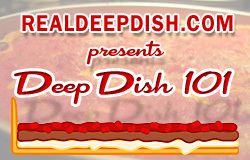 That’s not say that deep dish crust has no flavor. A well fermented deep dish dough can have buttery and beery flavors and aromas, greatly enhancing the overall flavor of your pizza. If that isn’t enough for your refined palette, you don’t need to go “bland” when you make your own deep dish crust at home. 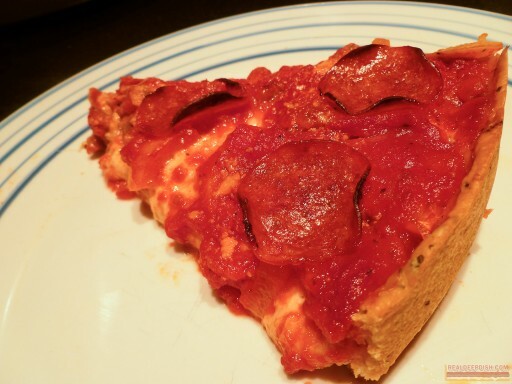 Making deep dish at home and want more flavor in your crust? You can add what you want to your dough. 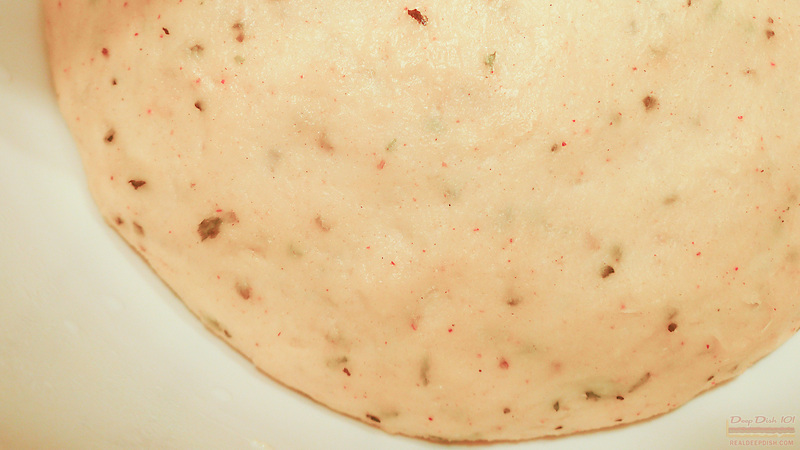 I often mix my dough with various herbs, whole or ground spices, hot pepper flakes or chile powders, and garlic. Grated cheese like Pecorino Romano or Parmesan, can also be an excellent flavor-booster. You could also just add a bit of extra salt or sugar. Just realize that additional salt and sugar could affect the texture of your crust, because both affect the yeast in opposite ways. Don’t forget that time can also be a flavor enhancer – a good 24 to 72 hours of cold fermentation can add those beery/buttery flavors I mentioned earlier. You can also switch up the oil/fat that you use in your dough. Sometimes I use bacon grease, lard, or coconut oil, instead of my usual corn oil, and of course Butter is an option, though it might serve you better brushing it melted onto the dough after it’s already been pressed out into the pan. 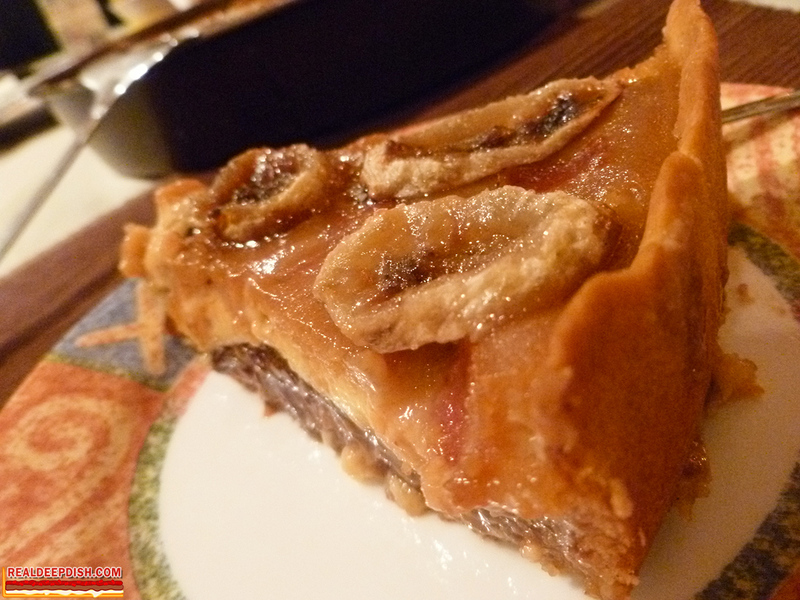 For a dessert-based deep dish (The Elvis Deep Dish) , I have even used peanut butter. You could even go as far as switching up or mixing the grains that you use for flour. Whole Wheat, Rye, Semolina, Rice Flour, could all be used in part with your All Purpose flour, to add more flavor to your dough. Some of you may even want to experiment with sourdough. The options are endless. The Elvis: Peanut Butter Crust, covered with milk chocolate and bacon, filled with a peanut butter banana custard & topped with caramelized bananas. 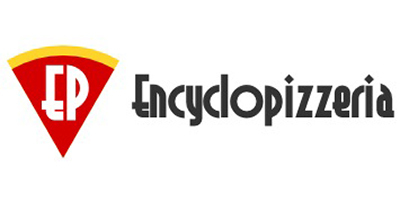 ‹ Chicago Thin Crust Pizza – Yes, it’s a thing. Sorry,but the chicago crust that I’ve tasted is far from bland,and doesn’t need extra spices to taste better.It tastes great on its own.It is the way the crust is made that is special and thats what everybody that has eaten authentic chicago style pizza is trying to achieve at home.By the way the pizza on the cover,does not look like the Chicago crust.It looks more like a pie crust so thats not it. I said I HEAR FROM OTHER PEOPLE who say deep dish crust is bland COMPARED TO OTHER PIZZA CRUSTS. I’ve never personally thought deep dish crust was bland, but to my tastebuds (and yours may vary), deep dish crust does seem to be the minor player compared to other pizzas. I’m not sure what you mean by “the pizza on the cover”, but my various photos of deep dish on the website vary in texture for any number of reasons, including my adjustments to the recipe over the years, how much I kneaded, how much the dough rose, whether I refrigerated it or not, etc. If any of them look like pie crust, that would have been one of the flakier versions of my dough recipe, and though your opinion may vary, is not entirely uncharacteristic of the style. 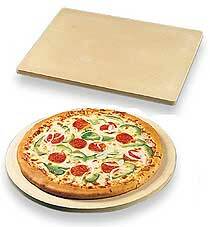 If you have any insight on pizza making methods that you’d like to impart, by all means please keep posting.